This plug-in enables you to export and publish photos from Adobe Lightroom directly to your WordPress blog using the NextGEN Gallery. Starting with version 3.0 the plugin also support export to the native Media Library. This plugin will not work with blogs hosted on wordpress.com because they don't include the NextGEN Gallery Plugin in WordPress environments. This plug-in is released as Shareware (no source code provided). The license allows you to install the plugin on two computers, for example a desktop and a laptop computer, owned and operated by a single user. 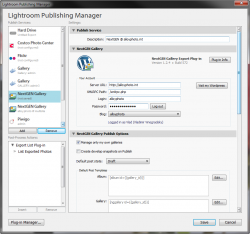 The plugin requires to purchase a new registration code for each major Lightroom version (e.g. 5, 6, 7, etc. ), unless the purchase was made within 3 months before a major release. You may use the unregistered (free) version at no charge, however some features (see below) are limited or disabled in the free version. The export capability is limited to 10 photos at a time. The number of photos in a single gallery is limited to 10. The NextGEN Gallery Export Options and NextGEN Gallery Publish Options sections are unavailable (grayed out). And finally, don't forget to register your copy. Your participation is greatly appreciated! Fixed false triggering of the NextGEN shortcode version mismatch warning. Publish Service: fixed the issue with displaying multiple copies of the "Server Settings Modified" message after changing the server URL. Lightoom Classic CC (version 8) compatibility. Fixed the "Unexpected Server Response" error when the server won't recognize user credentials. Export Dialog: fixed the issue with losing saved passwords when switching export presets. Export Dialog: fixed a couple of layout issues caused by longer texts in German translation. Create Gallery Dialog: fixed the "Invalid parameter not satisfying: aString != nil" error. Create Gallery Dialog: fixed the height of the Choose Page and Choose Post Category dialogs on low resolution displays. Creating new gallery: improved the Post Settings section's layout. Creating new gallery: added the ability to choose a post format. Added an option which allows to turn off the XMLRPC multicall feature (for situations when multicall is disabled in on the server). Fixed the "attempt to index field 'http' (a nil value)" error when the NextGEN Gallery plugin is not installed or disabled in WordPress confuguration. German translations: a couple of minor fixes. Reduced the number of requests on user authentication. This should mitigate issues with request the rate limit on the server. Publish Service - now the plugin gives an option to import existing galleries when the user creates a new publish service. AutoUpdate - fixed a bug preventing the installation of plugin updates in some cases. Lightroom 6: the removal of person tags now works correctly. Export Dialog: fixed issues with switching between different export profiles. Import Albums: fixed the error with importing albums in some situations. Create blog posts for individual photos - fixed the category selector. Fixed the "getSessionID - no session ID" error after using the "Reclaim Photos" feature. Publish Service: new major feature - Reclaim Photos. Now you can download NextGEN Gallery photos from WordPress to your hard drive and import them to your albums. New Gallery Dialog: implemented the ability to add new galleries to existing blog posts or pages. New Gallery Dialog: content placeholders no longer appear in posts when respective content blocks are left empty. HTTP authorization: fixed several intermittent issues. Auto Update: completely re-designed the update mechanism. Export Dialog: "My Server" and "My Account" are now in a separate collapsible section. Fixed the issue with customizations to performance settings not being retained. Improved the diagnostic of upload failures due to incorrect image resizing. Fixed a rare phenomenon in which UTF8 encoding in watermark presets caused issues with the creation of editing of photo albums. Other performance and stability improvements. Import Albums: fixed the issue causing the album hierarchy to import incorrectly in some situations. Import Albums: improved the confirmation message to show the number of re-parented and renamed albums/galleries when the operation results in a change to the album hierarchy. Implemented a workaround for the "Gallery not found (with id #" message (a rare NextGEN error). Fixed the "bad argument #1 to 'sub' (string expected, got nit)" error. Check Photos: added the ability to limit the scope of processing to selected galleries only. Fixed: renaming albums could make NextGEN forget contained galleries. Fixed error "The requested resourse no longer exsists on the sever" during the authentication when the Server URL or XMLRPC Path contain trailing spaces. Re-publishing to the native media library could throw an "Invalid Post ID" error in some situations. Now export destination (Native Media Library or NextGEN Gallery) is saved in the export preset. Fixed the issue with creating and manipulating the album-gallery hierarchy. Export Dialog: fixed the issue with setting featured images for blog posts. Fixed the "? :0 attempt to perform arithmetic on global 'count'" error during the export. Export Dialog: fixed the issue with uploading to new galleries. New major feature: Now you can create blog posts right from the plugin. Implemented full support for featured images in posts. When creating new blog posts, the selected image in the collection becomes the featured image for the post. Improved the image size validation mechanism. Now size validation works correctly when rendering uploads from smart previews and when doing percentage-based resize (Lightroom 6). Improved the session management mechanism in order to minimize possible issues with asynchronous operations. Fixed internal error "attempt to compare nil with number" when photo resize type is "percentage". Improved flexibility and performance of the throttling mechanism. Instead of pausing after every request the plugin now can issue a series of requests at full throttle, then take a pause. Blog posts: now will stay in Draft status until the end of the export/publish operation to the related gallery. Export Settings: added low/high pixel threshold options for validating image size. Publish Service: gallery-specific resolution setting now works correctly. Publish Service: gallery settings - added "Remove Person Info" option (Lightroom 6). Publish Service: fixed the issue with using global watermarks in gallery settings. Publish Service: fixed the issue with creating album sets. Fixed the issue with dropping suffixes from filenames containing a period. NextGEN PRO: Fixed the shortcode for Pro BlogStyle Gallery. Other fixes and minor improvements. Import Albums: fixed the issue with some galleries appearing at top level of album hierarchy, even though they belong to an album. Photo Templates: The template editor now has the ability to choose template tokens from a list. Fixed a "attempt to index global 'album' (a nil value)" error when linking galleries to pages. Publish Service: fixed the issue with blog selection when running multiple blogs on a single site. Publish Service: fixed the issue with creating galleries within albums. Export Dialog: now supports uploads to the native Media Library. Gallery Templates: implemented new "Featured Image" placeholders for blog posts. When the upload is finished, the placeholder will be expanded using the "most selected" photo (normally it is the first photo in the selection). Individual posts for single photos: now you can specify category and control publication date and time. Export Dialog: Fixed gallery list filtration by album. New blog posts and page: the pingback option on new blog entires is now turned off (a WordPress security concern). New Album Dialog: Fixed the explanatory error message when the Create button is disabled. Export Dialog: Minor fixes and improvements in the album caching algorithm. Fixed: "Import Albums" sometimes ignores newly added albums. Now the XMLRPC handler on the server can be renamed significantly easier - the "Rename XMLRPC" plugin for WordPress is no longer required. Now you can specify blog post publication date/time when creating galleries. Improved linking galleries to pages. Improved German translations (thanks to Joerg Knoerchen). Compatibility fixes for Lightroom 2. Export Dialog: implemented persistent caching. Once loaded from the server, album information is stored locally for quick access. Export Dialog: new Quick Filter feature which enables you to search galleries using a text string. Export Dialog: improved the layout. New Gallery Dialog: Now you can paste the name of the currently selected folder or collection with a single click. Fixed: moving galleries across albums gives an "assert failure". Fixed: the server URL field clears after the first entry. Fixed the issue with switching presets in the Export dialog. Now the throttling option is used correctly. Better handling of HTTP errors 401 and 503 when throttling is necessary to work around security measures of some hosting providers. Restored support for multisite blogs. Export Dialog: fixed an issue with switching export presets. Implemented throttling of the rendering queue to protect against high disk space consumption during large exports (supported in Lightroom 5.0 and above). The My Accoutn section has been split in two section - My Server and My Account. My Server section: now you can visit the WordPress Dashboard with a single click. My Server section: added a Help button linking to the plugin's FAQ page. My Account section: added a toggle button to reveal typed in password characters. Export Dialog: implemented persistent caching to minimize server requests when loading folder information. The Refresh Galleries button re-loads all albums and galleries from the server. Export Dialog: creating new galleries is now a separate action. Publish Service: implemented a workaround for the issue in NGG 2.0.66 with republished images multiplying in the gallery folder on the server. Associate Images: fixed the "attempt to call field 'out'" error. Fixed the issue with uploading photos that were removed from the Gallery through the WordPress administrative console. Fixed the "bad argument #1 to 'insert' (table expected, got nil)" error when the debug logging option is turned off. Fixed: Uploading the same photo to another gallery causes the photo to disappear from its original gallery (export operations only). Implemented throttling of the rendering queue to protect against high disk space consumption during large exports (Ligtroom 5.0 and above). Redesigned the album settings dialog and the gallery settings dialog to provide a more intuitive layout and improve usability at smaller screen resolutions. Fixed: Unable to choose post categories in the Gallery Settings dialog. Fixed an infinite loop when the Server URL contains backslashes. Now the Post Template dialog can be resized to make it easier working with large templates. Fixed: post templates for galleries are using shortcodes for albums. NOTE: post templates may need to be re-created by hand if they are using incorrect shortcodes. Fixed: The "About NextGEN Shortcodes" button on the Post Template dialog does not work. Added the ability to link galleries to pages when creating new galleries. Publish Service: fixed the "An internal error has occurred; ? :0: attempt to compare number with string." error when using album-specific resolution settings. Request throttling: added options for 3 and 5 seconds delay. Apostrophes in blog names now display correctly. Associate Images: Now you can fine-tune association by File Number Suffix using pattern matching. Associate Images: Now the plugin can detect and automatically adjust the time difference between the local computer and the server. Added the ability to initiate multiple uploads in parallel. Added the ability to customize server timeout in situations where the default 30 seconds interval is insufficient. Implemented the ability to reduce server load by specifying a throttling interval for server requests. Now you upload photos in the original JPEG format without any additional processing (as long as photos are already in JPEG format). Improved handling of name collisions when renaming albums. Publishing Service: Fixed the issue with creating album (collection sets) in some situations. Fixed an issue with applying automatic plugin updates. Improved validation of connection settings. Publish Service: fixed the issue with renaming galleries. Improved session management (the user is prompted to authorize less frequently). Publish Service - added the ability to customize sharpening options for individual albums. Publish Service - added the ability to customize sharpening options for individual galleries. Fixed the "attempt to call method 'removeObserver' (a nil value)" error. Fixed the "Invalid author ID" error when creating gallery pages along with new galleries. Improved validation of album titles. Export Dialog: The Albums drop-down shows no items. Import Albums: empty albums were imported as galleries. Create Gallery: nothing is selected by default in the Parent Page menu. Post Templates: fixed the issue with several placeholders working incorrectly. Fixed the issue with uploading when the "Create individual blog posts for each uploaded photo" option was used. Fixed the issue with logging in after a password change. Extras: Fixed the issue with Check Photos incorrectly reporting some photos to be out-of-sync. NextGEN Gallery 2.0.x: Fixed the issue with creating galleries inside albums. Fixed the issue with "Visit Photo at WordPress" and "Visit Gallery at WordPress" features. Added support for NextGEN 2.x shortcodes. Added support for NextGEN Gallery PRO shortcodes. Now you can order photos in galleries (NextGEN Gallery 2.0.40 and up). Now you can customize photo titles and descriptions using a combination of photo metadata and static text. Extras - Import Galleries now imports empty galleries as well. Improved the Automatic Update feature for future plugin versions. New installation package for Mac OS. Import Albums - fixed the "bad argument #1 to ipairs (table expected, got nil)" error in some situations. Create New Gallery - fixed the "bad argument #1 to 'pairs' (table expected, got string)" when there are no pages in the blog. Fixed the "? :0: table index is nil" error on photo upload. Added the ability to view additional information about server errors. Workaround: unable to parse truncated XML responses, which happens when a PHP script on the server is accidentally saved in UTF-8 encoding. Workaround: unable to parse invalid XML (unescaped binary data in the meta_data element) with NextGEN Gallery 2.0. NextGEN 2.0 Compatibility - Fixed album thumbnails in the Export dialog. Publish Service - added the ability to customize watermark and metadata settings for each individual album. Extras - The "Set Preview Image" feature now works correctly. Fixed the issue with renaming albums. Mac OS: Now watermark presets are detected correctly. Fixed the issue with creating new albums when there are orphaned categories in WordPress. Implemented a workaround for an HTTP Error 400 caused by extremely long cookie strings in NextGEN 2.0 Beta. Added experimental support for NextGEN Gallery 2.0 Beta. Publish Service: now you can customize watermarking options individually for each gallery. Now you can specify a category for new galleries and albums when creating blog posts. Improved the usability of selecting the parent page when creating blog pages for new galleries and albums. Added the ability to upload photos in the original format without rendering. Note: images must already be in the JPEG format. Fixed the issue with gallery descriptions remaining blank. Publish Service: now image settings (size, resolution, quality level, image format, color space) can be individually customized for each album. Now special characters (ampersands, quotation marks, angled brackets, etc.) in album titles are handled correctly. Fixed the issue with renaming unpublished albums. "Export with Previous" after creating new albums now works correctly. Improved the handling of a Windows specific HTTP Error 12032 (the action must be retried). Fixed the "Can't update this collection. An internal error has occurred: ? :0: attempt to compare number with nil" in some situations when using album-specific export settings. Opening the Lightroom Publishing Manager panel no longer triggers the "Not Saved" state unless you actually modify one of publishing options. Fixed issues with HTTP Authentication. Fixed the issue with having generic error messages (instead of a detailed description) when user authentication fails. Added the ability to create individual blog posts for every uploaded photo. Publish Service: now image settings (size, JPEG quality level) can be individually customized for each album. Publish Service: Check Photos now puts out-of-sync photos in the Quick Collection for your review. Publish Service: Fixed the issue with renaming unpublished albums. Fixed the error when editing galleries that were removed in Wordpress. Fixed the error in "Synchronize Metadata" when the photo's title is blank. Publish Service: now "Check Photos" clears NextGEN Gallery Metadata fields if photos are no longer published through the NextGEN Gallery publishing service. Publish Service: the "Associate Images" dialog has been redesigned to reduce the size of the dialog window. Metadata: Now the "exclude" flag for individual photos can be set from the NextGEN Gallery Metadata section of the Metadata panel in Lightroom and propagated to Wordpress when uploading photos or doing "Synchronize Metadata". Publish Service - All "extras" functions such as Import Albums, Associate Images, Check Photos, etc. 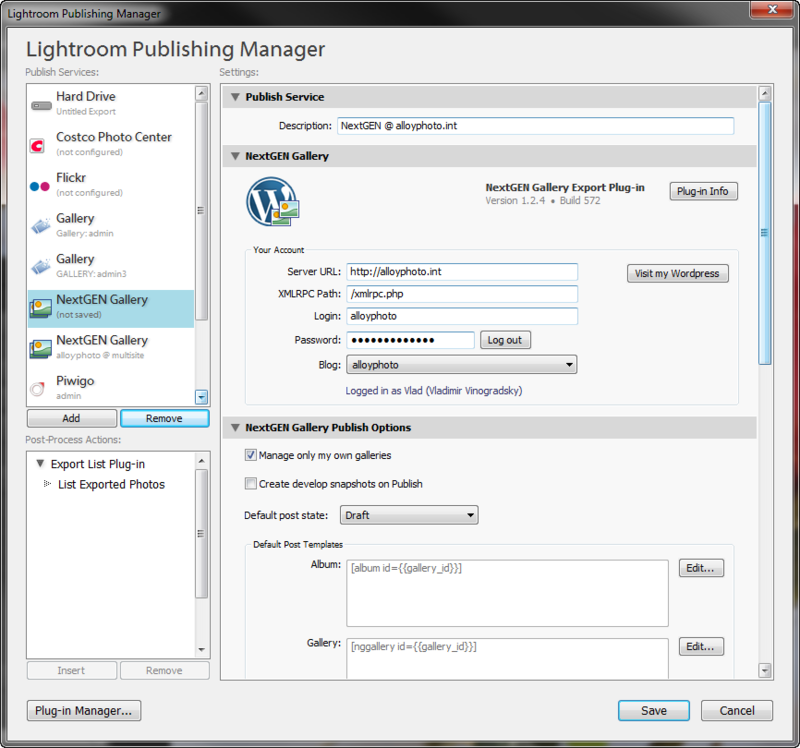 are now available right from the Publish Service Settings panel within Lightroom Publishing Manager. Extras - Associate Photos: The photo matching algorithm has been significantly improved to provide a faster and more accurate matching, particularly when file names contain spaces and other non-alphanumeric characters. Extras - Associate Photos: Added a new method of resolving conflicts - now you can prioritize pairing of rendered JPEG copies over raw originals. Extras - Associate Photos: Added a new matching method "by File Number Suffix" which compares only numeric image suffixes when searching for candidates. Added the option to turn the image sizing validation feature on and off. Fixed the issues with deleting published collection when the corresponding online folder is already removed. Restored compatibility with Lightroom 2. Windows OS: Fixed the issue with installing the plugin when the username contains accented characters. Windows OS: Fixed the issue with installing the plugin under a non-admin user account. Publish Service: Fixed - Browser displays page for new album sets even when I choose "no entry" for the Blog Entry type. Export: now export presets support multiple servers and user accounts. Export Dialog: improved the consistency of terminology (albums vs. galleries). Fixed issues with managing post templates for album sets. Fixed the issue with uploading when galleries in different albums have the same name. Publish Service: fixed issues with re-parenting album sets. Publish Service: fixed the "Go to Post" & "Go to Page" features for album sets. Publish Service: fixed the "Go to Gallery in Wordpress" features for album sets. Publish Service: The "Go to Gallery in Wordpress" menu item has been renamed to "Open in the Web Browser" to avoid the confusion between galleries and album sets. Remove the NextGenGalleryExport.lrdevplugin folder, then install the update using the new installation packages. Apply the auto-update. When you restart Lightroom you will be reminded to remove the .lrdevplugin folder and add the new .lrplugin folder (created by the auto-updater next to the old folder) using Lightroom Plugin Manager. I apologize for the hassle, but this is necessary to keep things consistent and in line with Adobe's recommendations. Fixed the issue with creating new galleries inside of an album set sometimes causing an "internal server error". Fixed the issue with creating new galleries inside of an album set causing other existing galleries to leave the album set. Export dialog: descriptions for album sets now display correctly. Added support for HTTP Authentication (RFC 2617). Added the ability to "Associate Photos" within selected albums only. Fixed the issue with moving albums between album sets. Extras: "Import Albums" now creates the album hierarchy correctly. Fixed the issue with updating metadata fields in the catalog when upgrading from older versions of the plug-in. Fixed the issue with "Synchronize Metadata" complaining about the publication status of selected photos. Export Dialog: Fixed the "bad argument #1 to pairs" error when there are no galleries in the account. Export Dialog: fixed visual issues speific to Mac OS. Improved error handling in situations when the server response cannot be parsed. Improved generation of default descriptions for publish services. Extras:Assign Preview Image - improved consistency of warning messages. Extras:Associate Photos - improved performance of conflict resolutions for flagged photos in Lightroom 4. Improved error handling in situations when XMLRPC path is incorrect. Fixed the issue with deleting album sets. Fixed the issue with handling nested albums 2 and more levels deep. This update is a quick fix for the issue with publishing photos, introduced in version 1.2.2. Added support for parent-child relationship between albums and galleries. Improved error handling when the server returns a non-XML response. Export Dialog: Fixed the "attempt to compare nil with a number" error when the selected album has no photos. Export Dialog: Fixed the "dng_error_bad_format" error with displaying thumbnails that are in PNG format. Fixed the "attempt to index local 'settings' (a nil value)" when clicking "Visit my Wordpress" in some situations. Fixed the warning message in the Export dialog when selected album contains no galleries. Fixed: In some situation the plug-in wouldn't show any galleries when the "Manage my own galleries option" is selected. The plug-in is now fully compatible with Lightroom 4. Fixed the issue with selecting the user's blog on a shared Wordpress hosting. Added the ability to control whether the blog post should be published immediately or left in the draft status. Added the ability to customize default template formats for blog posts. Debug output has been optimizied to reduce size and improve performance. Added support for the WordPress Multisite feature. The Export dialog screen now can filter galleries by album they belong to. Added the ability to import existing albums from Wordpress into the NextGEN Gallery Publish Service in Lightroom. Now existing photos in Wordpress galleries can be automatically associated with albums in the Publish Service within Lightroom. Added the ability to check for missing photos in the Publish Service. Added the ability to clear the "Modified to Re-Publish" status for selected photos. Added the ability to upload only metadata of modified photos. Now you can assign a preview image for your galleries. Implemented sanitiziation of server responses to avoid XML parsing errors when responses contain extra spaces or PHP notices. Implemented non-destructive replacement of existing photos upon republishing. Fixed XML parsing errors when renaming albums with blank descriptions. Fixed the error when creating a new gallery with a blank description. Fixed the error when using the "Go to Photo in Wordpress" menu action. Added metadata fields for keeping track of photos that were uploaded via the plug-in. Very interesting plugin, that I have bought. I can’t manage to upload direct to an existing gallery. I must first upload to a (dummy)-gallery and then move the files to an existing gallery. Isn’t there a way to upload direct? When you use the Export facility you can upload to any existing album or create a new one. When you use the Publish Services facility, you should import your existing album hierarchy into the publish service you create. To do so, go Library > Plug-in Extras > NextGEN Gallery Export Plug-in Extras and proceed from the there. Thank a lot for your response. Is it possible to export the GPS informations as well to use it in NextGEN Gallery geo? GPS information is part of the metadata, and it is included in your photos when you export them, unless you select the option to remove metadata or location information on export. If you are running Mac OS 10.8.2 you may get an error message saying the package can’t be opened because it’s from an unidentified developer. Simply right-click on package icon and choose “Open” from the pop-up menu. You will receive another warning about an undentified developer, however you will be able to choose to continue with the installation. DPI for web images makes no effect since you specify image size in pixels. It is only needed when you use inches – then DPI is necessary to specify how many dots (pixels) are in an inch. i made the Error on an other Setting. was realy sure to make the choice of changing the Size of the picture, and wonder why it takes 6 MB…. The serial number you are entering is not valid. You should have received an e-mail titled “NextGEN Plug-in for Adobe Lightroom – registration” containing a serial number starting with “NGG01”. Have you checked your spam folder? Let me know if you are still unable to find it, I’ll resend. Got it. It was in a spam folder. Thank you! Using up-to-date versions of Win 7 & Lightroom (both 64 bit) / NL I get an error: Plugin installs fine, but it can't be activated. Er heeft zich een fout voorgedaan bij het uitvoeren van een van de scripts van de plug-in. Well, the directory does exist and I do have full admin rights… but I guess the 'é' in the profile's username is causing problems. Will the pay version export nested albums/galleries from a LR collection? I've got multiple levels, perhaps 3-4 or sometimes more deep. Would be great not to have to do each gallery manually since I've got probably 100 galleries in all. Uploading nested albums is easy if you use Lightroom’s publish services. Both free and paid versions support publish service (LR 3.3 and above is required), however the free version allows only 10 photos in a single album. "Name is already in use"
"An online album with this name already exists, please choose another name." I've selected the "Golden Retriever gallery, right mouse and "Publish". I was assuming that the plugin would create the album structure down to the gallery only if needed. If it exists then it would just create the gallery. That's not what seems to be happening, sounds like it is trying to create the whole structure and since the album structure exists in NextGen, it is exiting. Am I using the publish feature wrong? Pete, to start with existing galleries, import the album structure into your publish service first. Go Library > Plug-in Extras > NextGEN Gallery Export Plug-in Extras and proceed from there. does anyone know how to get around the XMLRPC service enabled which has been disabled in the new wordpress 3.5 update. or does anyone know when an update for this will come out to get around this issue. I am going to try and research into this issue as soon as possible. XML-RPC is supposed to be enabled by default since 3.5 update (not disabled). But either way – the plugin doesn't work, it keeps asking to enable the service. 2. Stay tuned for a code patch, which I am going to post in a few minutes. I am intersted in using the NextGen Gallery export in Lightroom 4 and I loaded version 1.3.1 Build 1338. When I attempted to connect to my WordPress site, which is version 3.5, I get an error about enabling the XML-RPC in the Writing setting panel. From what I read the remote publishing has changed in WordPress 3.5 and the XML-RPC protocol is enabled by default. Can someone comment on if I am doing someting incorrect. Looks like a great plugin. I'm trying the free version and I am having a couple of issues. Is this because of the free vs. paid version? 2. The copyright in the metadata comes through with an Â in front of the copyright symbol. Hi Mike, please keep in mind that only keywords that are “marked for export” will appear as tags. The issue with the copyright character may have something to do with data encoding. I am going to to run a few tests. I have just ran a test – the issue with Unicode characters appears to be on WordPress’ side – it does not matter whether the image is uploaded through my plugin or exported as a file to the hard drive and then uploaded using the NGG’s uploader – Unicode characters in metadata become garbled. I am going to let Photocrati know about the issue. Vlad, thanks for all your hard work on this plug-in, it's great. The only thing I'm trying to figure out, and maybe it is a NGG thing, is how to browse through all these nicely created hierarchies that the plug-in creates. I know that I can input galliers onto pages or posts, but it doesn't seem like they can be browsed through if I insert an album. Hi Pete, thanks so much for your kind words! As far as I know, you can navigate multiple galleries if you put them inside an album and put a shortcode for the album inside a post (or a page). Here is an example: http://alloyphoto.com/ngg-album-page/ – as you can see there are three galleries that can be navigated to from the album’s root page. Albums can also contain sub-albums. I hope this aswers your question. Perhaps you can post or e-mail me a link to your album page so I can see how it looks like. I can't get the setup for this plugin to work. I have updated my WordPress to version 3.5.1 and have 1.4 build 1374 of your pluggin. I have my server coded as piedmontphotoclub.com which is my base web site address and the XMLRPC path: as /XMLRPC.PHP. This gives me message "invalid userid or password". If I code the server as piedmontphotoclub.com/wp-admin which is my WordPress logon screen then I receive message "unable to access XMLRPC hander on your server" (probably because the xmlrpc.php is in the base directory). How do I resolve this? Also, make sure to specify the same username and password that you use to access the administrative section of WordPress. your provider is not using mod_security in their Apache configuration – when badly configured, the module can block API requests. you have sufficient memory and post size limits allowed in PHP configuration. just installed this. When trying yo upload one -1- image, it gives me an error message that the free version doesnt support more than 10 images at a time. Hi, the limitation of the the free version is 10 images to a single gallery. If you already have over 10 photos in the target gallery you won’t be able to upload even a single image. Try uploading to a new gallery. When I try to configure this I'm getting the error message, 'This plugin requires NextGEN Gallery plugin for WordPress version 1.9.2 and above' but I notice that the latest version on your site is 1.6.1. Can you help? I have been utilizing the plug in for the last year through Lightroom to upload images to my wordpress galleries. I am all of sudden experiencing an Error proessing Server response: Error Domain = NSXMLParserErrorDomain Code-5 UserInfo=0x13906d0 "Line 11: Extra content at the end of the document" I am unable to export into the galleries because of this error. Will you please advise me? I greatly appreciate any help! Please submit your debug log, that is the best way for me to see what’s happening. For instructions, see the Support & Troubleshooting page. I would like to know if I can publish a post for each picture I have selected. This is certainly possible. There is an option called “Create individual blog posts for each uploaded photo”. You can also customize to your liking the template for single photo posts. Is it also posible to edit the Alt & Title Text and Description of the exported photo's? Currentlly the name of the photo is exported to the Title text and Description. It is possible this to be based on LR metadata? But the free plugin show only the Gallery Publish Option. Can you tell me what the Export Options are? Currently the plugin uses the Title and Caption metadata fields to populate the File Name and Description fields, respectively. I am planning to add the ability to include other Lightroom metadata fields in a near future. Export options are available in the Export dialog (File > Export). does this work with nextgen 2.0 yet? The plugin itself works with NextGEN 2.0. The problem is that NextGEN 2.0.0 has a number of issues – many users can’t upload photos with it. As far as I understand, the Photocrati team is working to resolve these issues as soon as possible. Hi. I was wondering if it is possible to either turn of sorting, or to add "sort by date" when exporting to Nextgen? Like it is now, I have to log into my NG gallery and change the sorting manually. I need to sort the images by date. Unfortunately the API offered by NG provides no way to specify the sort order for a gallery. This has to be done through the admin dashboard. Do you support NG gallery Pro or are the functions of Pro only handled in the admin panel? Hi, great plugin. I just installed it, but I can not publish a article (create gallery). Maybe it depends on my theme? You are trying to create a new gallery along with a new blog post (the “Create Blog Entry” option), however, the shortcodes that you have in your template do not match the version of the NextGEN Gallery plugin on the server (V1 and V2 use completely different shortcodes). Go back to the settings screen and choose the correct setting and convert / modify your templates. I publish a bunch of images using the plugin and insert them into posts, various sizes. If I now make some changes to images in Lightroom and re-publish them, what do I need to do to ensure the changes percolate through to the images in posts? Same for twenty fourteen featured images. I believe you don’t need to do anything. Re-publishing (do not confuse with re-exporting) keeps original photo IDs, so all references to these IDs will remain valid. You're right, partially. It does for images in posts but featured images which head posts in they twentyfourteen theme don't. This has the unfortunate effect of becoming a problem for another plugin I'm using that uses featured images for product thumbs.I'll work around it. I do appreciate it's beyond your control but WordPress media management is a horrible mess, isn't it. Check your spam folder, that is always the first thing you should do. Considering that you did not respond to the other 2 e-mails I sent you, I am almost certain this is attributed to spam filtering. Also, use the Support and Troubleshooting page on this site to retrieve your serial. Do you have any idea what is wp.getProfile and how do I rectify it? Make sure you have WordPress version 3.5 or above (see the Requirements section) on the plugin’s home page. I am trying to upload blogstyle to my wordpress blog (as Jared Platt showed on his creative live last week) and it keeps saying “we cannot display this gallery” I have purchased the Nextgen Plus plugin and installed it. can you advise please? Turns out my plugin (3.0.2) is using the wrong shortcode for the “pro blog style” gallery. I am going to fix this in the next update. Meanwhile, you can modify the gallery template to correct the shortcode. A very good plugin. I am happy about it. Thank you. The service and support is unbelievable good. I’ve got very fast the answer on my questions. I am really surprised of this awesome good and fast help. That’s perfect. Thanks for letting me know. I am sure this is a false alarm, I built and signed the executable myself. I rebuilt the executable using the new certificate. WD should be happy now, please let me know if you are still seeing a trojan warning. Thanks!